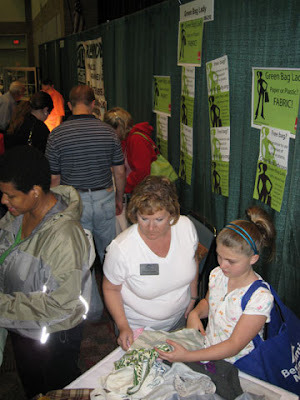 Green Bag Lady: LIVE GREEN EXPO! 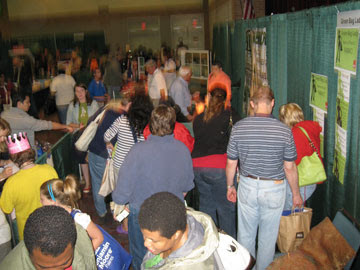 Wow, we had a great time in Texas at the Live Green Expo in Plano. We gave out 1500 bags in less than 6 hours. That is about 5 bags per minute. As you can imagine, it was absolutely crazy in our little booth. 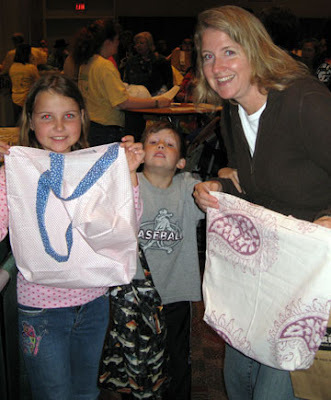 If you couldn't make it to Texas or we ran out of bags before you got there, you can still leave a comment on the Easter Freebie post below to get a bag. Here are some photos from Texas. . .
Bagette Alicia, me, Bagette April and Bagette Anna. . . Some bags that found good homes. . . 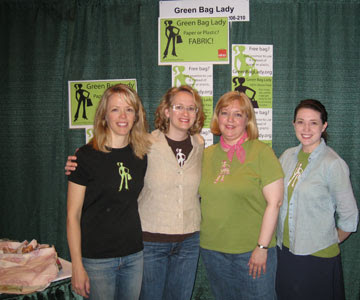 Some of the MANY people who got a bags for promising to use them instead of paper or plastic. 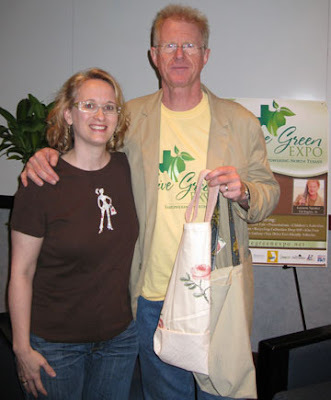 . .
And the highlight for me, I got to meet actor Ed Begley Jr. who is a green activist, wrote a great book, Living Like Ed and has an environmental website you can visit here. 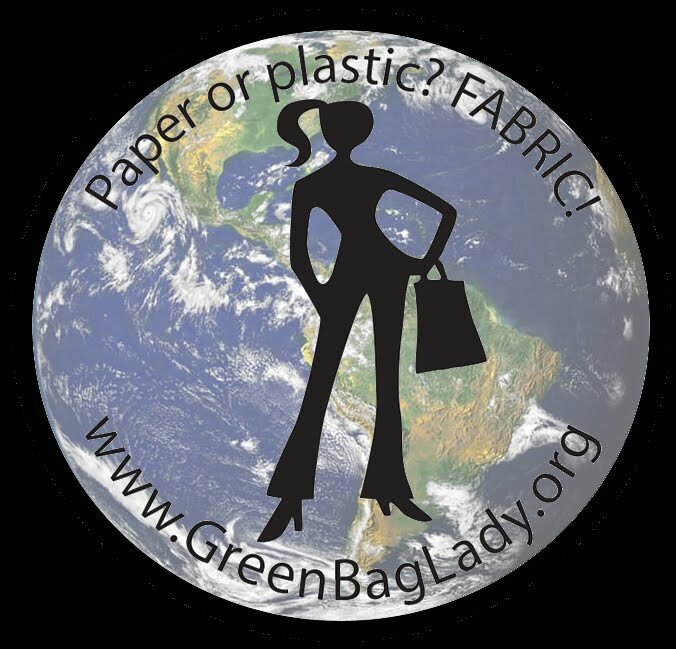 He and his wife now have Green Bag Lady bags. I hope they both enjoy them. . .
Teresa it was great to meet you and the Bagettes this weekend. I love your project. I was so looking forward to using my bag, and someone took off with the one I choose (I offered it as a prop for our booth photos, silly me!). 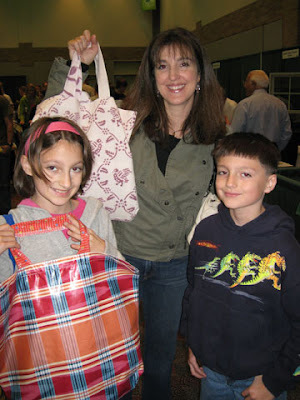 But my son came by your booth later and picked one for himself, so we have a bag to stay in our family. I should have the Bag Exchange photos posted later this week, I can't wait to see them all! Teresa, thank you for sharing the photos. 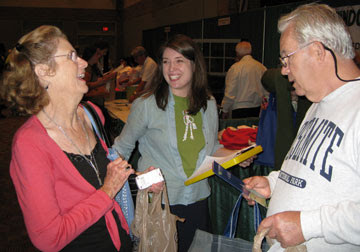 Glad to hear you had plenty of bags to give away; you and the Bagettes worked so hard to make it happen! WOW!!! Sounds like you had a great time. I can't wait for you to get to Gualala!